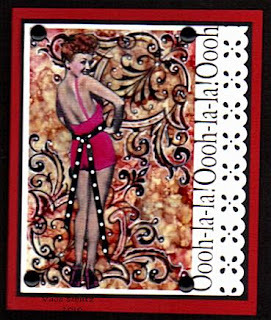 Vada's Blog Stamp Inks and Paper : Gingersnap Creations Challenge #61 “Heat”. I have two TQ”s from “The Technique Junkie Newsletter”. Acetate Frost w/ Alcohol Inks ( 06) Meets Bandanna (08). For stamps, The Lady is from “The Stampsmith”, and Background stamp is from Bo Bunny. (I’m not sure who makes “Oooh-La-La”. Punch is one of Martha Steward’s. Thanks for stopping in. Stay Cool! Oh yes! Hot indeed! Very nice piece! Love how you combined two techniques! Vada this is just adorable! Hot Hot Hot!!! Oh la la indeed! Thanks for playing the Gingersnap Creations Heat Challenge! Very hot indeed, love it. ooh la la indeed! Love it! This is wonderful-I love her ribbon!